Sports Illustrated did not have to think too hard or too long about what image to place on their cover this week; and as usual the image is a winner (figuratively and literally). 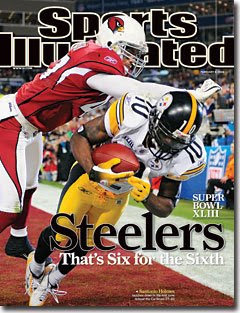 This week’s issue – the cover of which features Santonio Holmes’ game-winning touchdown catch with the headline “Steelers… That’s Six for the Sixth” . . . hits newsstands tomorrow. In addition, a special commemorative issue recapping the Steelers’ 2008 championship season arrives at area retailers throughout western Pennsylvania on Thursday. By midnight half the team was dressed in white Pittsburgh Steelers bathrobes, their fingerprints mucking up a sixth Vince Lombardi Trophy, their cigars burning smoky and sweet. After one of the greatest Super Bowls ever played, wide receiver Santonio Holmes wiped tears from his eyes, owner Dan Rooney pulled on a championship baseball cap and linebacker James Harrison asked if he could fall asleep right there on the locker room floor. Among the quietest in the group was the quarterback, Ben Roethlisberger, who slipped out of the room alone, his robe covering his civilian clothes, the ball with which he knelt to close out Pittsburgh’s heart-stopping 27–23 victory over the Arizona Cardinals in Super Bowl XLIII cradled in his left arm.